Attractive large antique Victorian mahogany converted side table. A lovely large Victorian mahogany side table. We date this table to the mid 19th century. It originally started out as a square table piano that has now been converted to house a set of drawers. The table sits on a later made base with downward tapered legs. The main table top is oblong in shape and has three drawers fitted. They have very attractive brass drop handles mounted on very decorative backplates. The top surface has an ornate brass gallery to the rear. The table has an overall height of 44.5" (113cm), a main table surface height of 35" (89cm), a width of 67" (170cm) and a depth of 25" (64cm). This lovely Victorian mahogany table remains in good solid condition with only minor surface markings commensurate with age and usage. There are a few surface marks and light scratches to the table top. One of the brass finials has been repaired and the later added base is showing a bit of wear including a couple of legs being very slightly splayed. 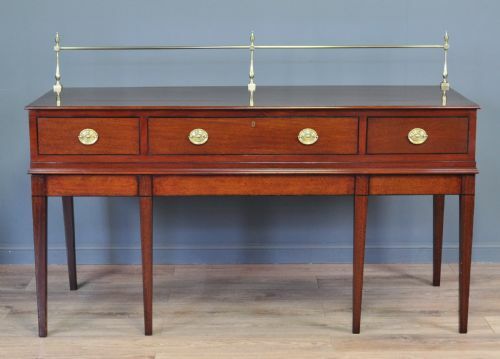 This remains a stylish and elegant mahogany converted table which could function as a large side table or as a smart hall table. It will continue to provide good service for many years to come. Attractive large vintage art deco light walnut sideboard cabinet. A lovely vintage light walnut art deco sideboard. We date this sideboard to the first half of the 20th century. The sideboard sits on a shapely stepped plinth base. The main cabinet consists of two cupboards below a large drawer and a lidded section. 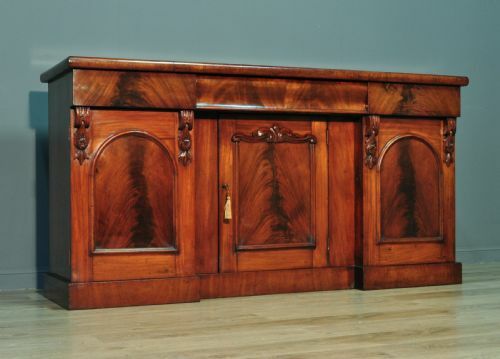 The whole sideboard has been veneered with well matched finely figured walnut, there is an attractive shaped gallery to the rear. 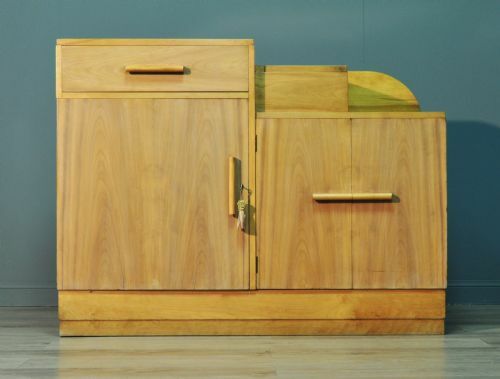 The doors and drawers are fitted with decorative art deco stand out wooden handles. The larger cupboard is fitted with a lock (key supplied). The interior of all the cupboards are fitted with mid mounted full width removable wooden shelves. The central lidded section has been lined in brown baize. The table surface has an attractive stepped top. 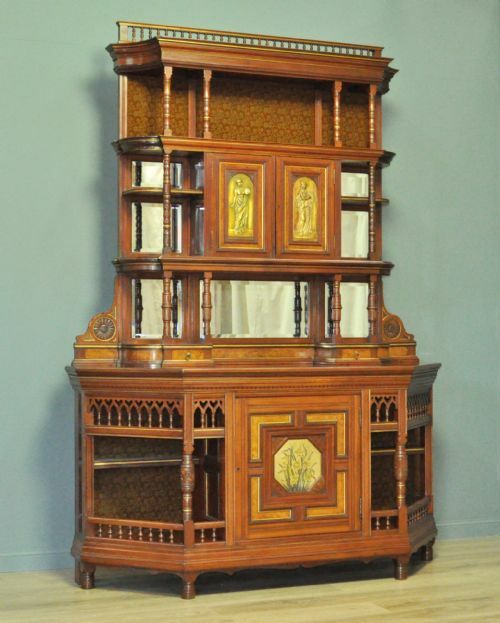 The sideboard has an overall height of 37.5" (93cm), a width of 48" (122cm) and a depth of 19.5" (50cm). 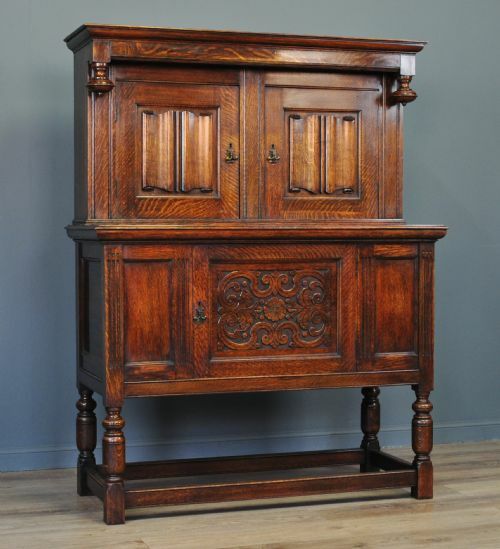 This lovely vintage walnut sideboard has been constructed to a high standard and remains in very good solid condition with only very minor surface markings commensurate with age and usage. There are some minor marks to the top surface and the finish has mellowed slightly over time. 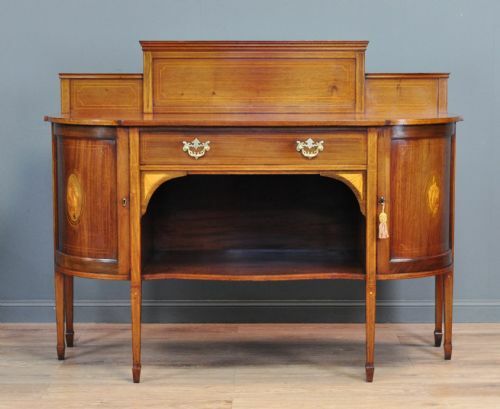 This remains a very stylish and elegant art deco walnut sideboard. It will continue to provide good service for many years to come.